Francis remained an unapologetic admirer of Mr. Lincoln and eventually did move to Oregon in 1859 having sold the Journal to Baker and Bailaiche. He became editor of the Oregonian and the Oregon Farmer. 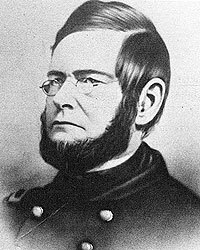 He was also appointed an Army major and paymaster by Mr. Lincoln, serving until 1870. Robert S. Harper, Lincoln and the Press, p. 2. Robert S. Harper, Lincoln and the Press, p. 3. William H. Herndon and Jesse W. Weik, editor, Herndon’s Life of Abraham Lincoln, p. 179. William H. Herndon and Jesse W. Weik, Herndon’s Life of Abraham Lincoln, p. 296. William H. Herndon and Jesse W. Weik, Herndon’s Life of Abraham Lincoln, p. 297. Roy P. Basler, editor, The Collected Works of Abraham Lincoln, Volume I, p. 89. Rufus Rockwell Wilson, editor, Intimate Memories of Lincoln, p. 64 (William H. Souther, Magazine of History, September 1906). Francis Fisher Browne, The Every-day Life of Abraham Lincoln, p. 183. Rufus Rockwell Wilson, editor, Intimate Memories of Lincoln, p. 64 (William H. Southern from the Magazine of History, September 1906). Walter B. Stevens, A Reporter’s Lincoln, p. 157-158. Roy P. Basler, editor, The Collected Works of Abraham Lincoln, Volume II, p. 65 (Letter to John Addison, September 27, 1849). Roy P. Basler, editor, The Collected Works of Abraham Lincoln, Volume II, p. 64 (Letter to John M. Clayton, September 16, 1849).